Ta-daaaa - Unicorn Puke (aka Clairvoyant) in all it's multicolored shimmery glory. I can't stop staring at my nails to find hidden blips of purple, flashes of pink, sprinkles of green. Blue, green, orange, pink, purple flakies with a bit of a multichrome flash at certain angles in direct light. Truly unique and definitely a complement to Unicorn Pee (aka Clarins 230) and easily makes its way onto my Top 10 list. Look what I got in the mail today! The Super Powers pre-order from Cult Nails! Yayzer beams! Cult Nails will be running a Black Friday sale this coming weekend (November 25 - 28). All polishes will be $7.75 each, nail treatments $6, and glass nail files $10. I can't wait to try these beauties out! Labels: "hits no olimpo" apolo "ozotic pro" "ozotic" "ozotic 533" 533 "holographic nail polish" "hits"
Life and work got just ridiculously crazy busy. I have quite a few manis to share but I'll start off with my first Halloween manicure. I purchased my Zom-body to Love at a local beauty supply store and had Black Shatter from when it was released though they can be purchased in a 4 pack or a Pair Em and Scare Em duo. 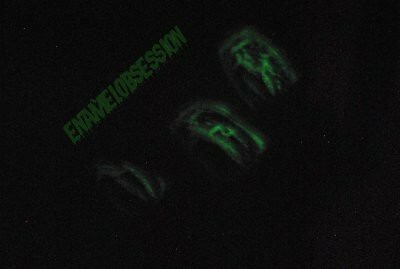 Zom-body to Love dried rather sheer and matte so I used a base color so as not to have to build up the glow in the dark polish. Anyway, I've had this mani for about 3 days with only minor tip wear to note. I'm going to try to do a different Halloween-themed mani this weekend and I hope to post results then! 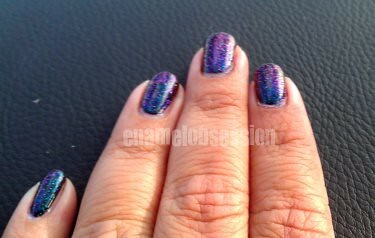 Labels: opi "glow in the dark" halloween "zom-body to love"
I thought I'd start my nail polish blog out with a bang. Why not with the ever-so elusive Clarins 230 (aka Unicorn Pee). Not only elusive, but $$$ on eBay. 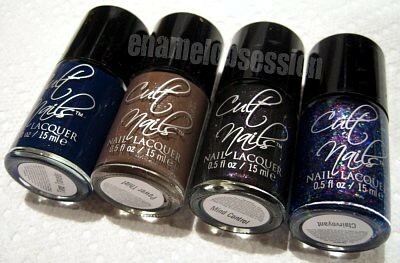 The theme for this week on tPF (if we/I chose to partake), was HTF or rare nail polishes. I don't have too many HTF or rare polishes since I have a relatively young collection and missed out on some awesome polishes this past decade. However, I participated in an RAOK (random act of kindness) on the nail care subforum on tPF and was gifted an dazzling set of simply gorgeous and a-maz-ing nail polishes. When I opened the package containing this...my jaw dropped. Beautiful, huh? A vial of bottled sparkly rainbow! 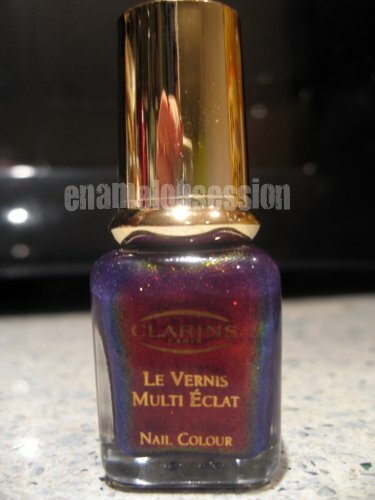 By itself, Clarins 230 is a bit sheer with a sheer violet base with a multichromatic shimmer. The formula is thin and easy to control. 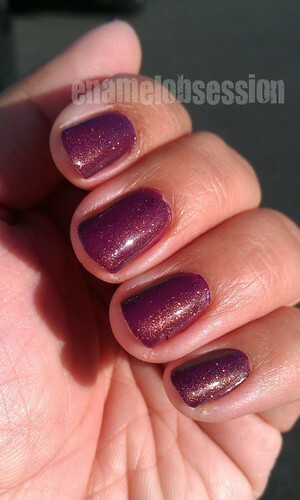 I chose an untried purple I purchased in Vancouver, BC to layer under - Joe Fresh Orchid. I didn't photograph the base color by itself (doh!) but it is a medium red-based purple. My gripe about the Joe Fresh bottles were the larger diameter bottle cap with a short brush. My small stubby fingers can't grasp and control the polish as well as I'd like though the formula itself was pretty smooth. I love the rainbow of shimmer particles that change colors with different lighting and angles. I'm definitely going to play more with Unicorn Pee in the future (tee hee). Labels: "clarins" "clarins 230" "joe fresh"
My name is Manda and I'm obsessed with nail enamel. Whew. Got that off my chest. After a 12 year hiatus from all things manicure-related, my passion for polish became reignited on the Nail Care subforum on tPF (The Purse Forum) back in February 2011. Reignited? More like a firestorm. I've managed to expand my collection from 5 in mid-February to 284 in mid-July. Yup, acquiring 279 polishes in 5 months would be considered by many as obsessive. Or crazy. Or as I like to say, I'm just making up for lost time.